Turkish Airlines has seen passenger growth continue to rise during the month of October, its passenger numbers were up by 5% reaching 6.5 million passengers. The carrier also saw its load factor increase, up to 83.4%. International load factor increased by 3% to 83.2%, while its domestic load factor reached 85.1% and it also saw a rise in international connecting traffic to another international flight, up 7%. The airline has also recently announced an increase to its Istanbul – Hurghada (HRG) – Istanbul service, from 31st March next year the route will be increased from 7 to 10 flights per week. The carrier is also increasing its schedules on the Istanbul – Sharm El Sheikh (SSH) – Istanbul route. This is also being increased from 7 to 10 flights each week, starting 1st April next year. Flight Global is also reporting that the airline is about to acquire another three Boeing 777 freighters, which will be delivered to the carrier beginning September next year with the next two due to arrive in January and February 2020. The training department of the airline already has 14 flight simulators and following a deal signed recently with HAVELSAN, that number will significantly increase. 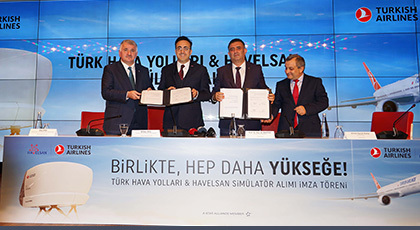 The deal was signed by Turkish Airlines Chairman of the Board and the Executive Committee, M. İlker Aycı, and HAVELSAN Board Chairman, Prof. Dr. Hacı Ali Mantar, and is for international D-level certified 5 'Full Flight Simulators' as 2 Boeing 737MAX and 3 Airbus A320CEO/NEO, and 6 ‘Flight Training Devices’ from HAVELSAN to be set into operation in 2020 and 2021, according to the agreement. Thus, while the number of Full Flight Simulators in Turkish Airlines Flight Training Center will reach 28 with the other simulators to be received in 2021, the first domestic production of Boeing 737MAX and Airbus A320CEO/NEO type simulators will also be included in this number.